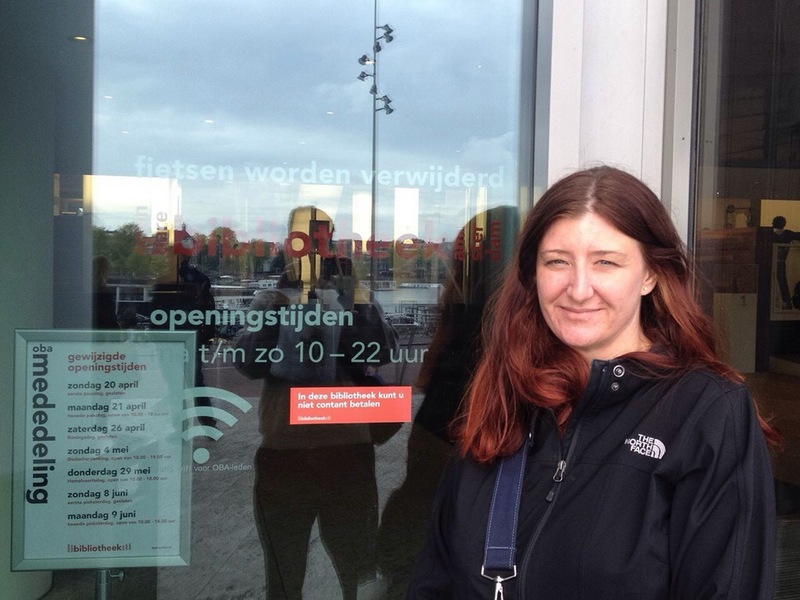 Amsterdam: day 5 – Rembrandthuis and a return to the jenever bar. On Day five we decided to visit the Rembrandt House Museum. It was awesome. It was the best museum experience I have ever had, actually. On the day we went they were not doing the printing demonstration, which made us sad. HOWEVER, when we reached the top floor, in the studio they were giving a free printing workshop! We got to make our own etching and prints from our etchings to take home. I decided that it would be perfect if I drew my beloved Zero 2000 and then made an etching of it. I love to draw but it isn’t my strongest talent. 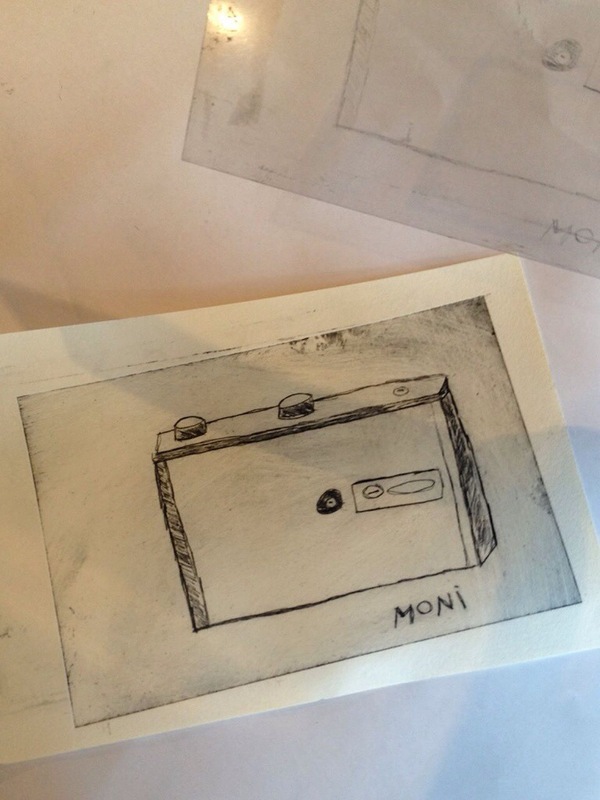 As I was setting up my camera to draw it, I thought: “I need to pinhole myself drawing my pinhole camera.” So I did. Afterwards we met up with Brendan, Lorraine, and Jeff for a quick coffee before Brendan and Lorraine had to catch the train. Brendan suggested we go check out the library a few blocks away. We meandered over there and Raf took my photo in front of it. We went inside and Oh. My. God. This is the most amazing library I have ever seen. There was an entire floor devoted to music – and they were actually playing music at the desk! The Art collection was spectacular. There was a PINHOLE display on one of the floors. There is a cafe on the top floor AND there is a bar. I want to work at this library. Raf and I were also amused that they also used the Dewey Decimal system and we will be sure we tell our students about this when we teach about it. Honestly, it’s kind of awesome that it is used all over the world. 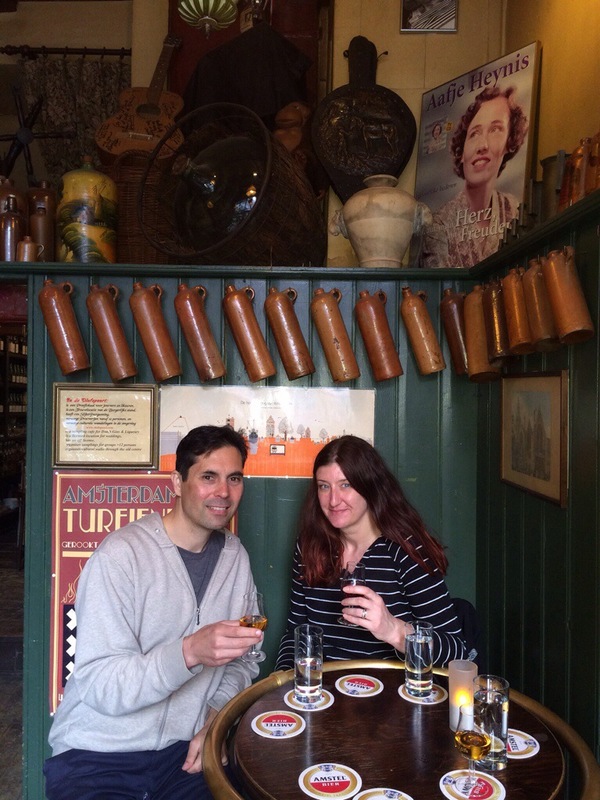 The last great thing of the day was going back to the jenever bar with Jeff. We chatted with the beautiful Ana, who was our waitress. Jeff took this nice photo of Raf and I.
my favorite person and me. And I, of course, had to pinhole the experience. That’s so cool you got to do a printing workshop. I love the pinhole shots! The one in the restaurant is especially cool.